Researchers at the Weizmann Institute of Science in Rehovot, Israel, have discovered a new physics trick. While it’s not exactly Superman vision –– yet — the camera developed by Ori Katz, Eran Small and Prof. Yaron Silberberg sees through objects using a simple light bulb, a standard digital camera and the basic technology found in everyday digital projectors. Their camera can see through nearly opaque surfaces such as skin or frosted glass — even around a corner into another room if the door is open. Other scientists around the world have produced similar results, but only when using laser technology and not in real time. While the applications are far down the road, the new discovery points the way to non-invasive cancer diagnostics. Katz, a post-doctoral student, tells ISRAEL21c that biopsies could be circumvented if this approach is further developed by the medical imaging industry. The international press has gone wild over the idea, stirring much exhilaration among the inventors. Their trick hinges on the camera’s ability to see through any object that can scatter light – including skin. Though skin doesn’t look transparent, light passes through it. This is more obvious when you hold a flashlight to your hand in the dark. Where you can see the light shining through, this is an example of scattered light. 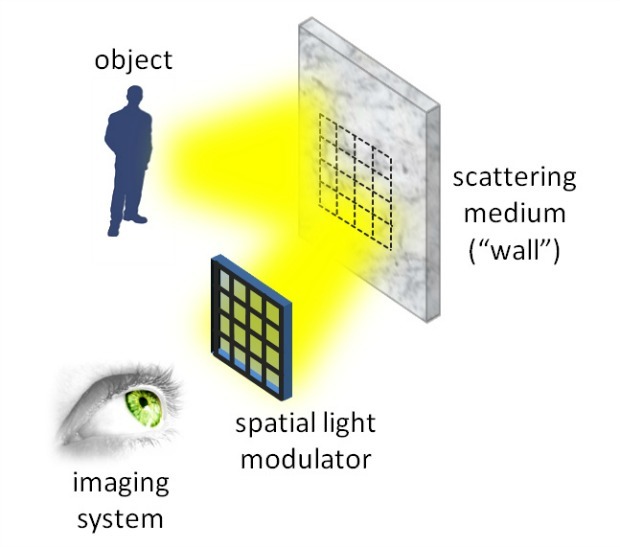 An illustration of how the device “sees” around corners. Katz explains: “Light is a sort of radiation. The general public doesn’t see it that way; they see it as just regular light. We used regular light from a halogen lamp to be able to see through most of the materials that we encounter today. Most of them are not transparent when we look at them, like our skin or an eggshell. “The problem is that they are absorbing light, and then the light is scattered. Just like when you look at fog. Microscopically, fog is transparent but the movement [of the fog] prevents you from seeing through it,” he explains. Until recently scientists did not fully understand the way the light is absorbed by these objects and then scattered away. But new technologies allow physicists to amplify what they are seeing to find patterns. “Once we’ve learned the patterns — the way a material or object scatters the light — we can apply the inverse scattering pattern using a big crystal and a small LCD screen,” says Katz. Spies around the globe will be pleased to know this device can be put together for a few hundred dollars by “hacking” a digital projector, says Katz. The equipment he used cost about $10,000, but for novelty purposes it can be done for much less. Which is another appeal to the technology – it’s simple, straightforward and relatively cheap. Katz does not expect wave front shaping to replace an MRI, but theoretically, it could be used to non-invasively “see” through the skin to identify malignancies instead of a surgical biopsy. Intriguingly, the same approach can provide a peek around corners. “The surface of the wall is not as smooth as a mirror, yet it scatters and scrambles all the directions of the light. We took a small portion of the wall, learned its properties, and now we can use it as a mirror,” he says. But before you quit your day job to take on the next Mission Impossible or superhero job, take note that the team was only able to see through a small patch of material, with poor contrast and fuzzy resolution. “There are still lots of obstacles to overcome using our technique,” admits Katz.